And secondly, yes, the Phillies are leaving – headed south on various jet planes as the start of spring training is less than two weeks away – which also means baseball is back! Are you ready? We are. We’re going stir crazy over here and can’t wait for warmer weather, hot dogs and the boys of summer back playing at CBP. Now, some of you may or may not know this but each year the team’s baseball equipment and personal effects magically arrive at Bright House Field prior to the first workouts via truck – the equipment truck to be exact (we know, creative naming of said vehicle). But, in all serious, it’s a pretty important operation to get all of the players’ equipment, uniforms, POWERADE mix and sunflower seeds safely to Clearwater, Fla. Without it the team can’t get to work preparing for the upcoming season. If you’ve ever wondered just how much stuff is loaded on said truck, you’re about to be mind-blown. That’s a lot of pants. 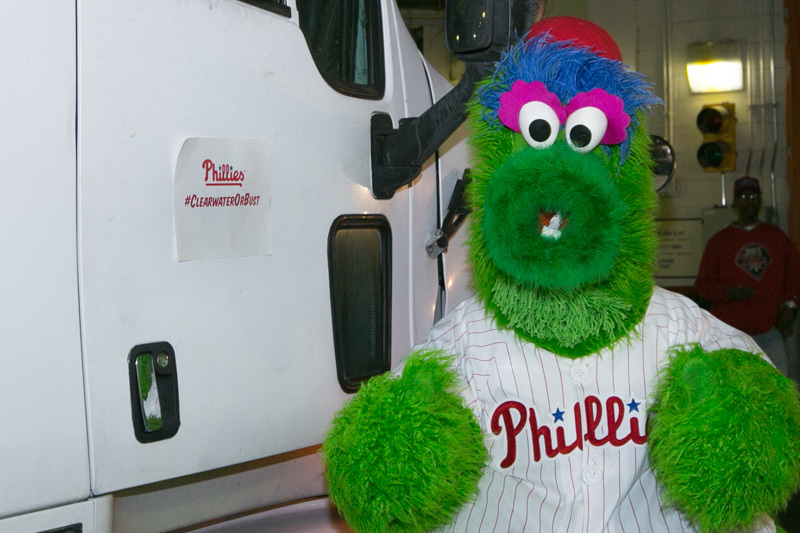 As we say hello the first signs of spring and a new season of Phillies baseball, we’ll say goodbye to the 53-foot Phillies equipment truck next Thursday, February 6th as it departs from Citizens Bank Park to make the 1,058-mile journey to its final destination of Bright House Field in Clearwater, Florida. Feel free to stop down and say bye in person that morning – the more the merrier! 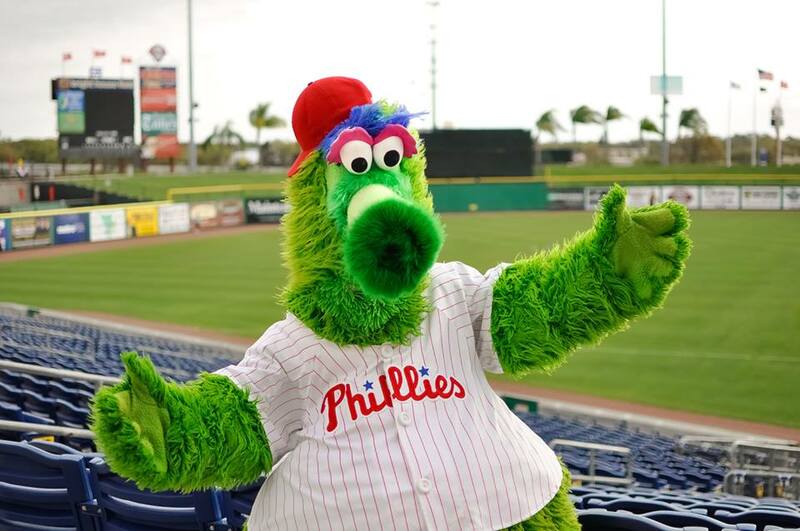 You may even see the Phanatic try to hitch a ride (as he usually does) to get to a more Galapagos-like climate than the chilly Philadelphia winter we’ve had. We couldn’t decide really SO there’s two this week! Have a great weekend and we’ll check in with you again next week! It was the return of both the polar vortex AND Billy Joel to Citizens Bank Park this summer, some of your favorite Phils returning to the ballpark for our Offseason Minor League Banquet Week and the solo return of Cody Asche for an @Phillies #CodyChat. Lots of goings on this week, lots. First up, here’s a video gem of the Phanatic doing his best rendition of Billy Joel’s greatest hits during yesterday’s press conference announcing Joel’s return to Philadelphia after five long years. Fortunately for everyone, the real Piano Man will take the stage at CBP on Saturday, August 2nd. Tickets go on sale next week so make sure you get them, Big Shot. Seriously, if you haven’t seen him live in concert, do yourself a favor and buy a ticket – Mr. William Joel is truly awesome. Side Note: Also coming this summer and bringing some country flavor to CBP is Jason Aldean. 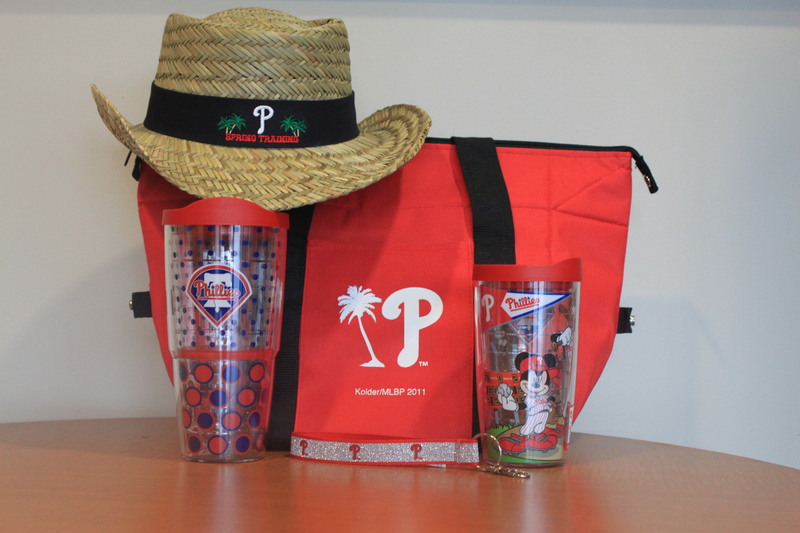 So, grab your cowboy boots and get ready…It should be a great weekend for music at CBP. Incredible segueway using a Billy Joel song, we know. 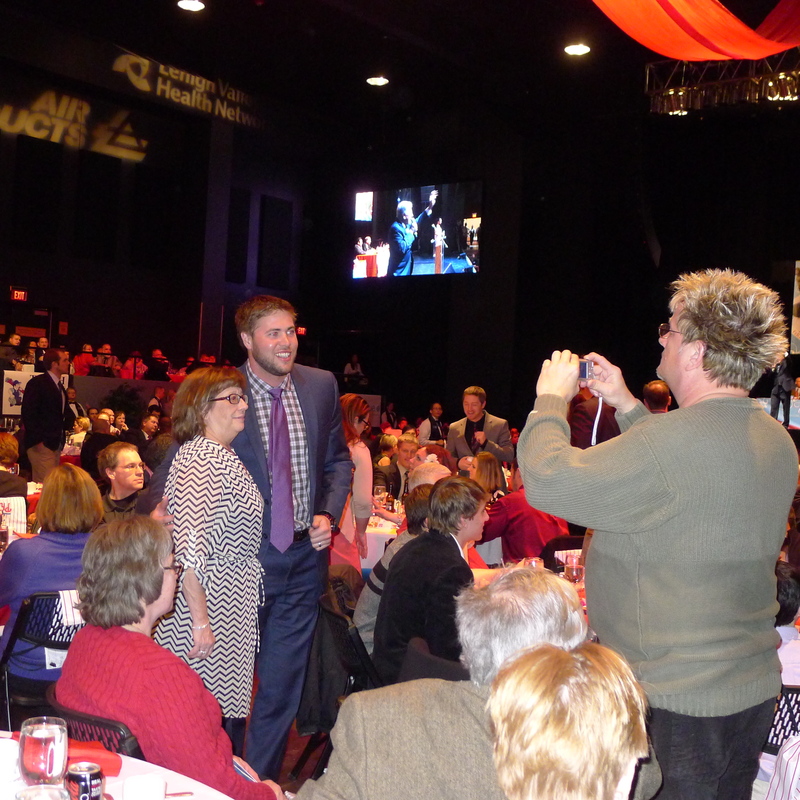 As part of the Offseason Minor League Banquet Week, the Phillies traveled west to Lehigh Valley IronPigs‘ territory for their annual Phillies Winter Banquet on Thursday. The event, which is also the flagship fundraising event for IronPigs Charities, features players and personnel from the Phillies. 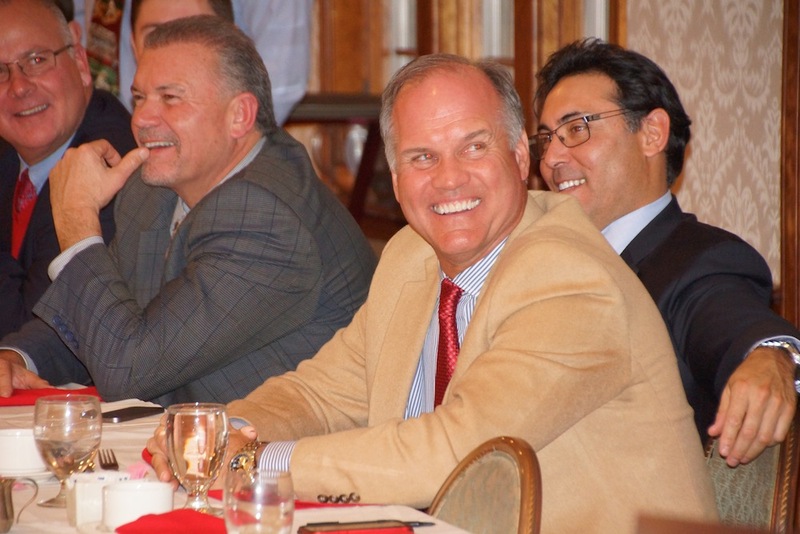 Phillies manager Ryne Sandberg, third baseman Cody Asche, outfielder Darin Ruf, right-hander Jonathan Pettibone, broadcaster Scott Franzke and Phillies GM Ruben Amaro Jr. attended the event. The week is sort of a homecoming for some of the Phils who played for the affiliates before hitting the big leagues, including Ruf who took time to pose with a fan. 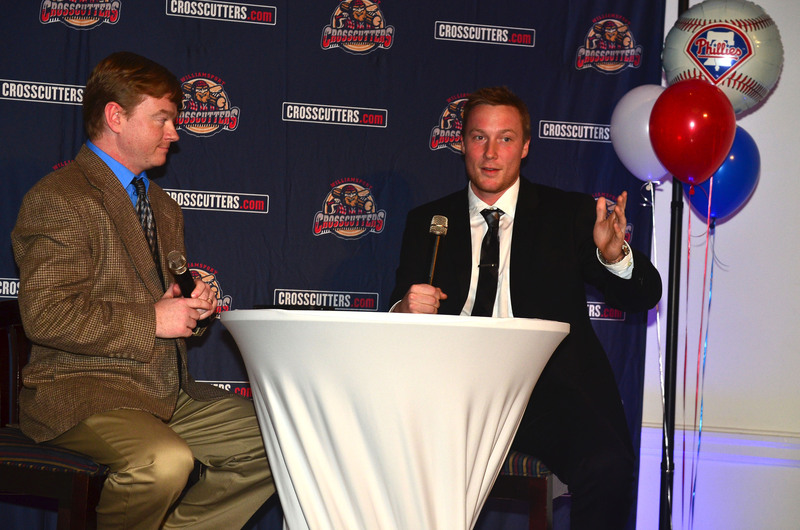 The Williamsport Crosscutters‘ hosted their sold out 8th annual Hot Stove Banquet on Monday and welcomed the Phillies, including Sandberg, Asche and broadcaster Gregg Murphy. A portion of the proceeds benefited Lycoming County Special Olympics. 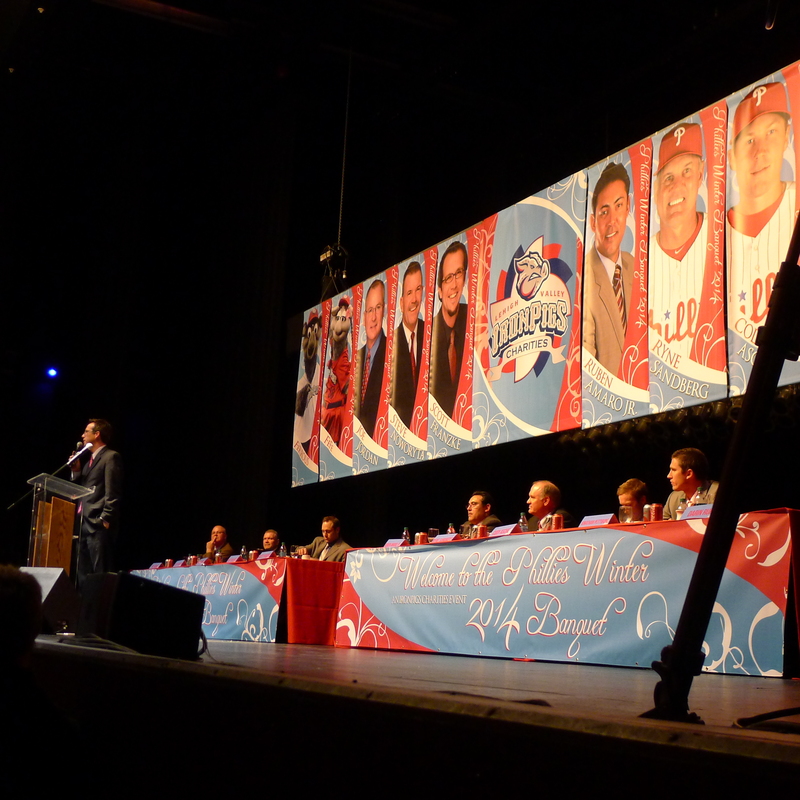 The Lakewood BlueClaws also had a stop on the banquet circuit on Wednesday where they hosted Sandberg, Ruf, Pettibone and broadcaster Tom McCarthy. Looks like they had a good time according to Ryno. Lastly, thanks to Winter Storm Janus, the Reading Fightin Phils’ stop was postponed. Thus proving another reason why we can’t wait for spring training to get here already and this winter to be OVER! We love to see the brotherly love in our great city of Philadelphia, especially between our guys and our sports complex neighbors. After hanging with fans for an@Phillies #CodyChat (check out the see ya later selfie above), Smasche took in his first Flyers game and shared his excitement with the Twitter world. And that’s all from us. TGIF and see you next time. Panoramic shot, we’re getting so tech-savvy with our smartphones, of the prospects as they toured MLB Network studios, including the very cool Studio 42. Well, not school exactly…but they learned things, lots of things. Each year, the top minor league prospects, there were eight in the class of 2014, are selected to participate in the Phillies Prospect Education Seminar, a four-day program which consists of various workshops with front office executives, representatives and guest speakers including former and current Phillies players. It’s a great opportunity for the youths to get a taste of the major leagues and what it’s like to be part of the Phillies organization. Here are some highlights from their week in Philly. 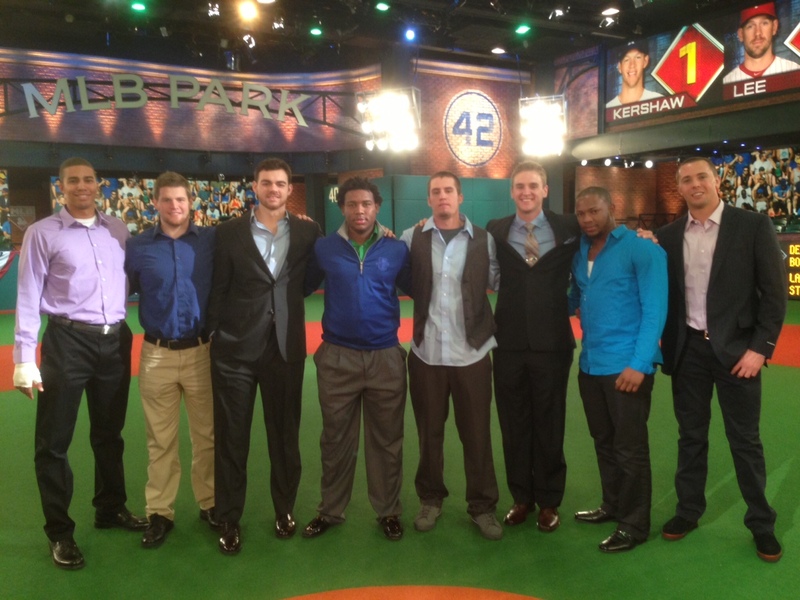 Prior to this week, some of the minor leaguers knew one another but they really bonded over the course of the program. Group shot in Studio 42. From left to right: OF Aaron Altherr, RHP Kevin Munson, LHP Jesse Biddle, INF Maikel Franco, RHP Ken Giles, RHP David Buchanan, OF Leandro Castro and OF Kelly Dugan. Now, if you don’t know these guys yet – what are you waiting for? These guys are young, talented athletes who will all hopefully have bright futures and great careers playing baseball right here in Philadelphia. Check out Prospect Watch on phillies.com for more info on all the Phillies prospects and then impress your friends with your baseball knowledge. Great for parties and even awkward subway ride convos with strangers too. 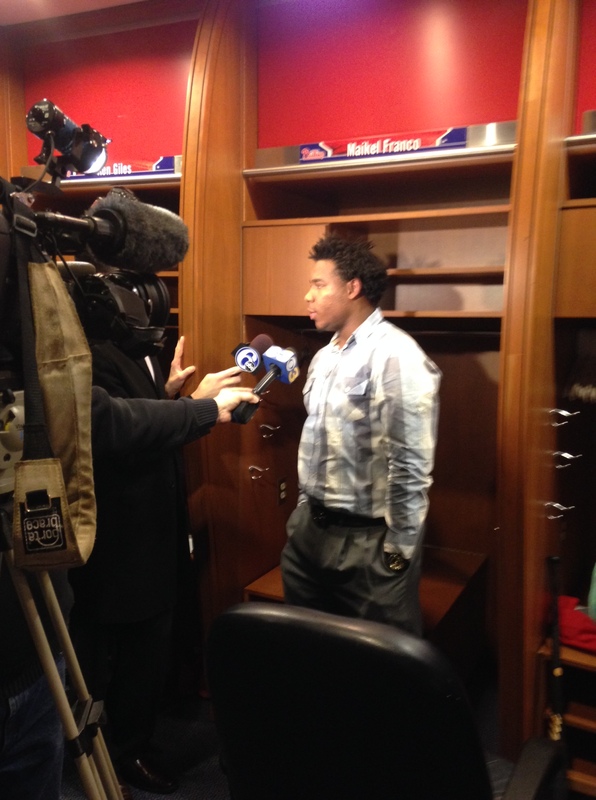 The media is a big part of being a major league baseball player. They are there to report to our very interested fans. The prospects had a close encounter with media members during an availability in the Phillies Clubhouse and we snapped some photos during the event. Outfielder Kelly Dugan, not only a top Phillies prospect and son of Hollywood director Dennis Dugan but also buddy of Adam Sandler. 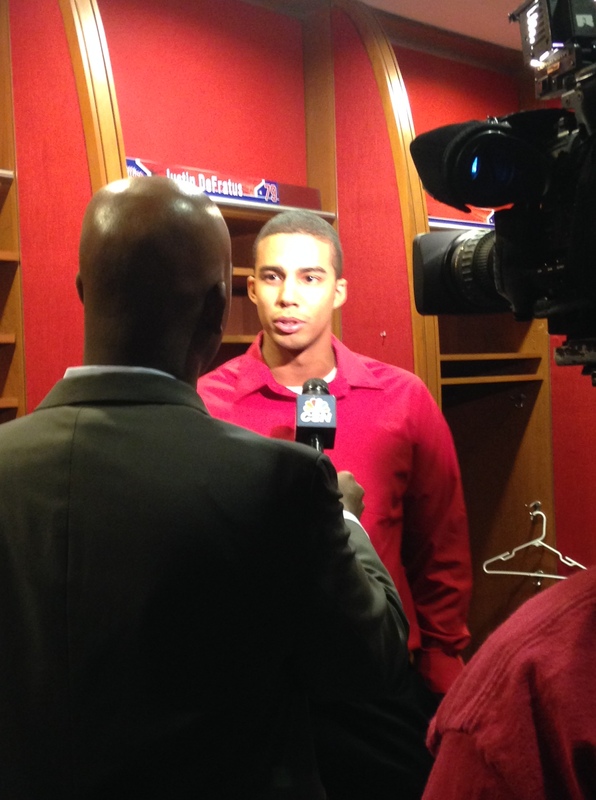 Outfielder Aaron Altherr sported his Phillies red while being interviewed by Comcast SportsNet’s Marshall Harris. Infielder Maikel Franco, no stranger to the spotlight, chatted with local TVs and writers. 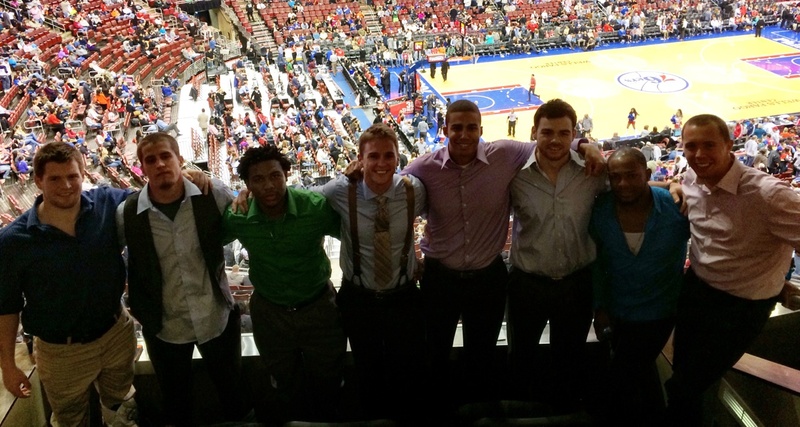 As you are well aware, Philly is a true sports town and the guys got a taste of that part of the city’s culture by taking in a Sixers game while they were here. It must be said that the Sixers were excellent hosts, getting the guys on the Jumbotron and providing them with some nice gear to take home as well. 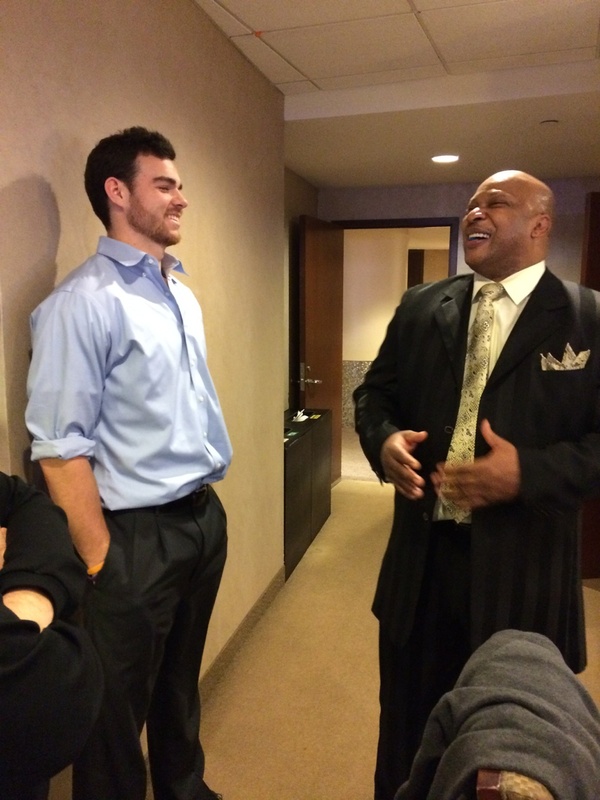 Jesse Biddle even had some quality time with Sixers legend World B. Free. Three of the prospects, hometown guy Jesse Biddle, JMU grad and Rule 5 Draft pick Kevin Munson and Atlanta native David Buchanan, made time to chat with some fans on Twitter with #ProspectsChat. Just another way for fans to get to know their Phillies. 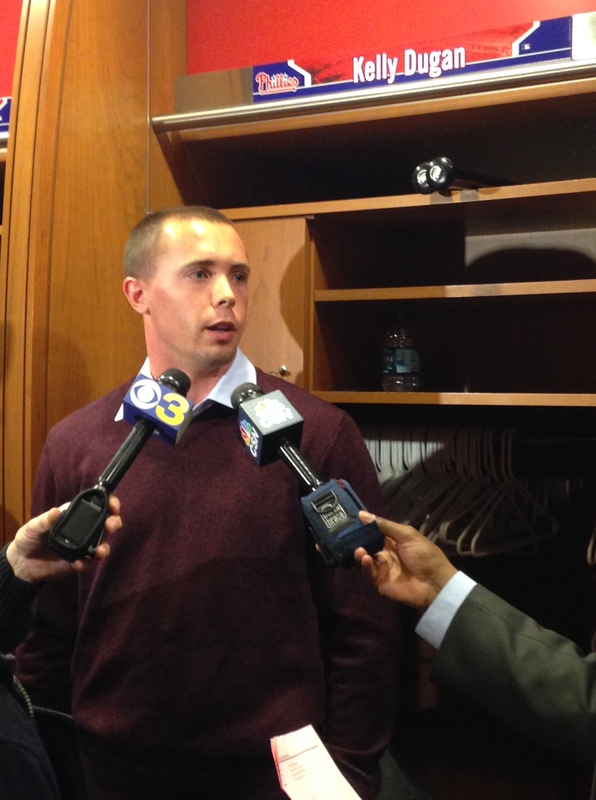 Side Note: Chase Utley also stopped by the @Phillies couch earlier in the week for #ChaseChat. You should be on the lookout for future chats with your favorite Phillies…including a certain third baseman who may be joining us next week! We know you like to get some inside perspective on the Fightin’s so Biddle gave some insight on the week, including what it was like to hear from Chase Utley and Brad Lidge on what it means to be a major leaguer and what the program as a whole meant to the group of prospects. Comes from the #ChaseChat Twitter takeover earlier this week from our very own Kevin Frandsen…so would it technically count as two tweets for the week? And One Phinal Thing…Welcome Back Kotter Charlie! 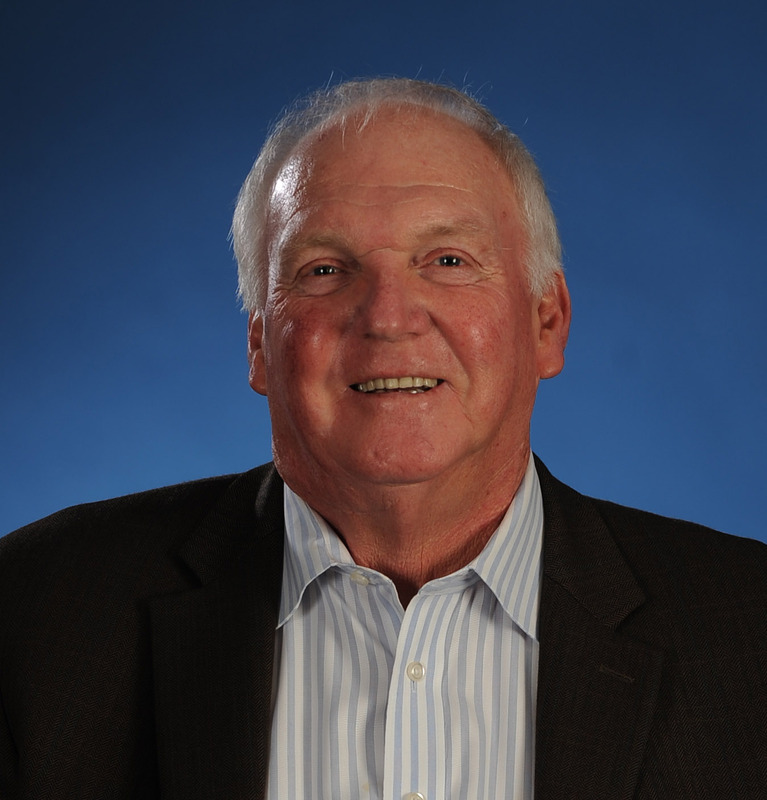 The Phillies are thrilled to welcome back Charlie Manuel as a senior adviser to the general manager. We hope you are too! #1. 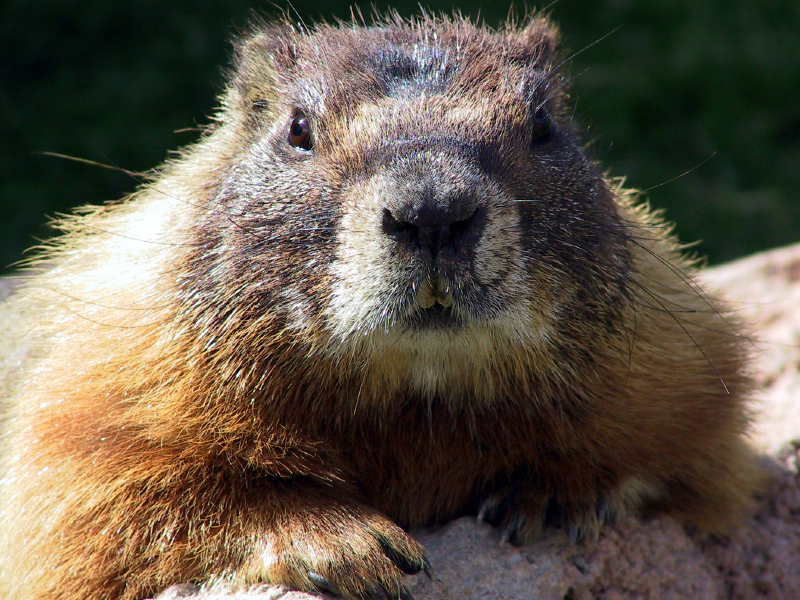 Don’t depend on groundhogs for weather advice. Period. Putting hope into the shadow of a very large furry animal is never a good idea. And that Phil character is currently unavailable until next month anyway. #2. Definitely try to think spring…spring training. That’s Florida sunlight you see…and it is glorious. Get into that spring spirit by planning a getaway, easy peasy. You already know about the fan trips from last week’s post but maybe you’re just looking for a weekend getaway with the family or your friends. Now, before you book your flight and hotel, you should probably grab your spring training game tickets,which went on sale yesterday. We have to divulge something else which may excite you into packing your bags today. This year, 2014, is special. How is it special? Well, not only will this spring training showcase our 2014 Phils but you’ll have another opportunity that has never been offered before. Curious? You should be. 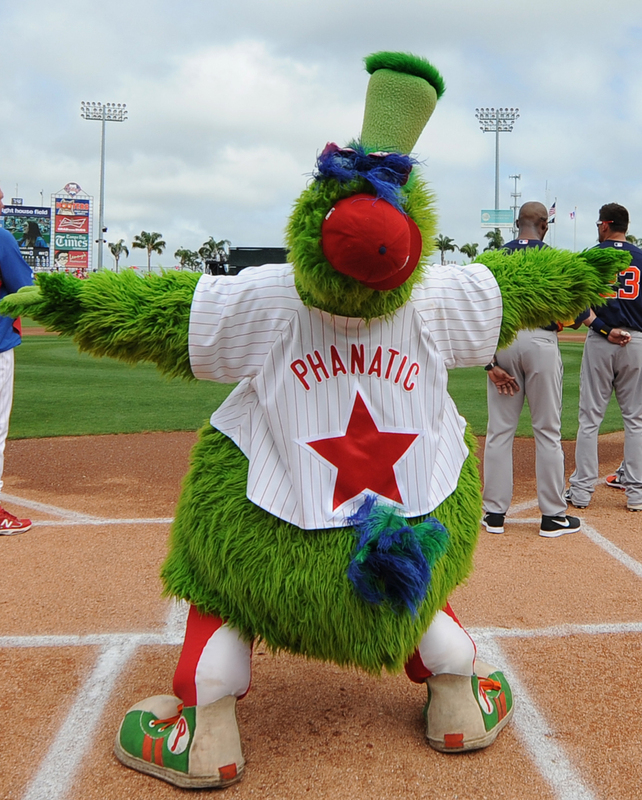 We talk about the Phanatic because we love him…you love him…who couldn’t love him, really? Well, this year he’s heading to Clearwater to take up residency for the entire spring training season! You could have so much quality time with this green guy – but you have to be there to collect it. And don’t worry – he’ll be back in Philadelphia for our On-Deck Series on March 28 and 29 with Pittsburgh and definitely the Home Opener on April 7 against Milwaukee – but he’ll be back with a tan. 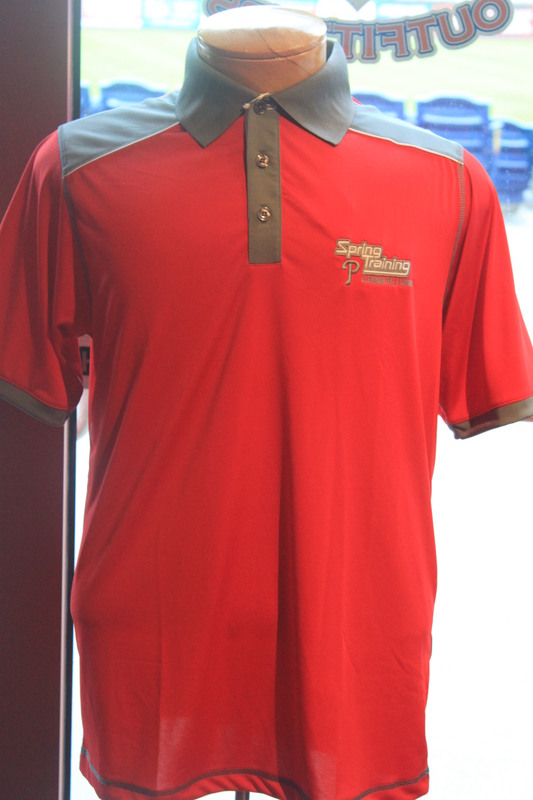 Also, while you’re watching the game at Bright House Field, make sure you stop by the Diamond Outfitters store. They have a great selection of apparel and merchandise with a fun, Floridian flare that will make everyone back home wish they came on the trip with you! Stop by the Tiki Bar after the game for great entertainment and make tons of new friends who all share your interest in the Phillies – fun, right? When you’re not watching the Phillies, there’s plenty to do in the gorgeous, and much warmer, Florida weather. Have a relaxing day at Clearwater Beach, rated #1 in the gulf region, but don’t forget sunscreen – we don’t want you returning to Philly looking lobster-like! Golfers can hit the green, adventurers can hop aboard Tanks-A-Lot Clearwater and get their scuba dive on, amusement ride enthusiasts can hit up Pier 60 and everyone can end the day with cocktails and dinner at the many great restaurants in the area. Clearwater is truly a destination in itself, making it not only great for the sports fan but also families and kids of all ages. So what are you waiting for? 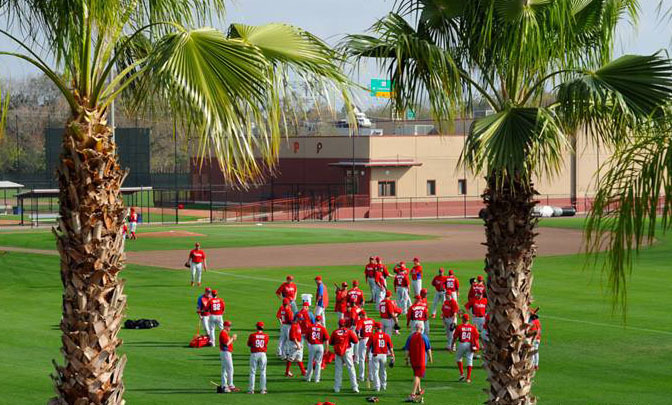 Stop those winter blues by planning your getaway to Phillies Spring Training today! Here’s our favorite player tweet from the week. We’ll do this when one of the guys makes us laugh (more than usual), makes us slightly jealous or just mildly intrigued by his social outreach. And we’re going to relive them with you! 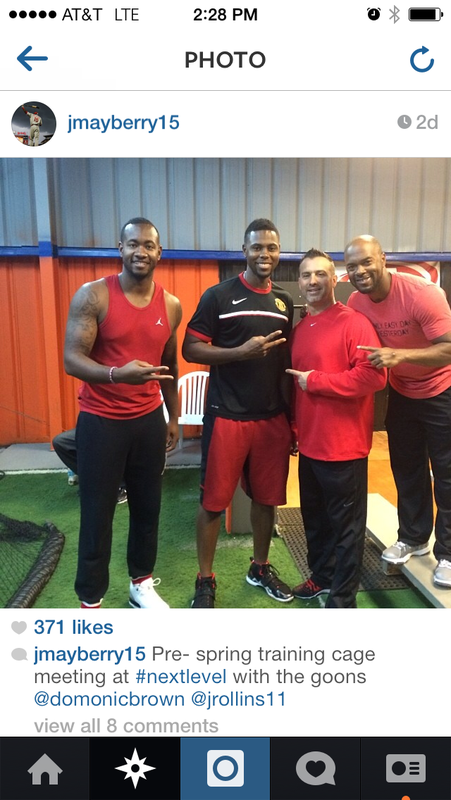 Domonic Brown made us incredibly jealous by not only being in beautiful Cancun, Mexico on the Phillies Phancation this past week. That’s a given. But he looked like he had a good time too, and for that we are extremely jealous we didn’t sneak into the Phanatic’s suitcase. Check out his Instagram collage of awesome-ness below. 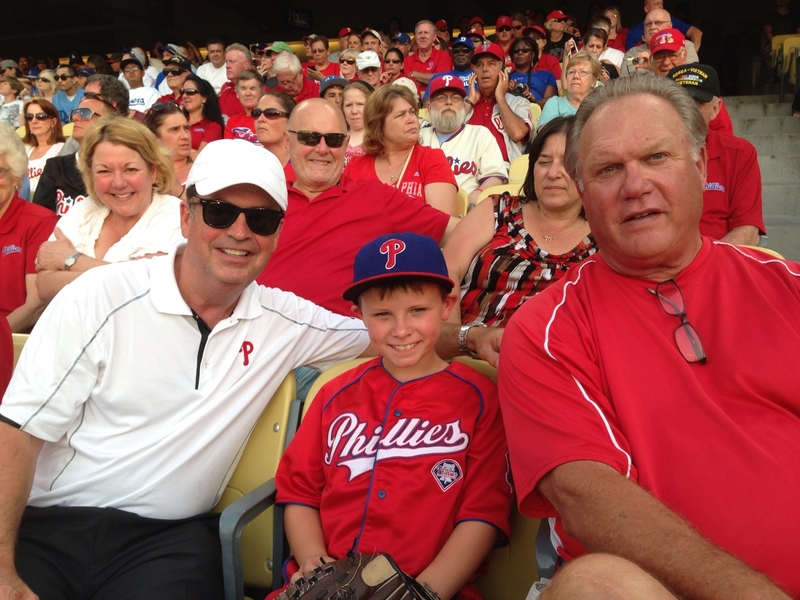 His close encounter with the best mascot in all of sports really put us over the top. 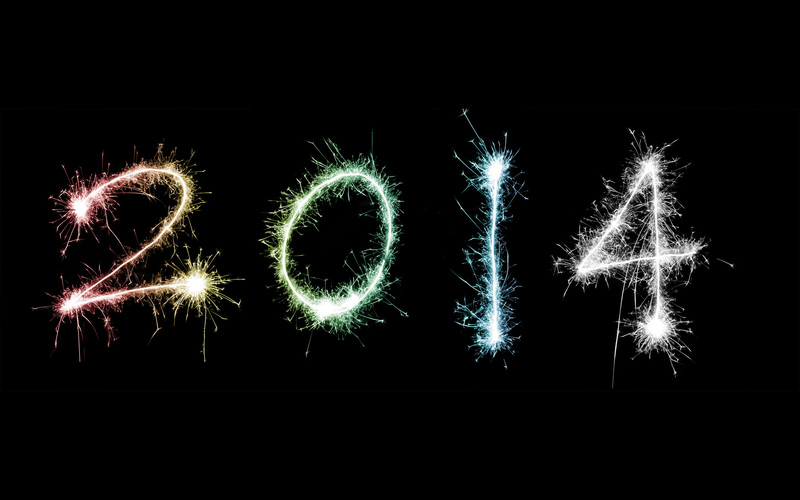 Welcome, welcome 2014! The New Year is all about fresh starts and new beginnings. We couldn’t be more excited to start off a new year with our manager, coaching staff and team for a brand new baseball season. Here’s to health, happiness and a prosperous start to this beauty of a year! The New Year subsequently means New Year’s resolutions. These go way back, we’re talking Babylonians and Romans, people. Let’s keep the tradition going and make some now – new year means a new you! Now, if you’re like most Americans, you’re either starting off with a bang, off the wagon already or still thinking of what yours might be. If you’re still forming them or need to reboot your resolve, today is your lucky day – we have a couple ideas that will help bring you to a better you this year. So, now that the holidays are officially over, the “best time of the year” may have left you with some ill-fitting pants from one too many cookies, glasses of egg nog, etc. 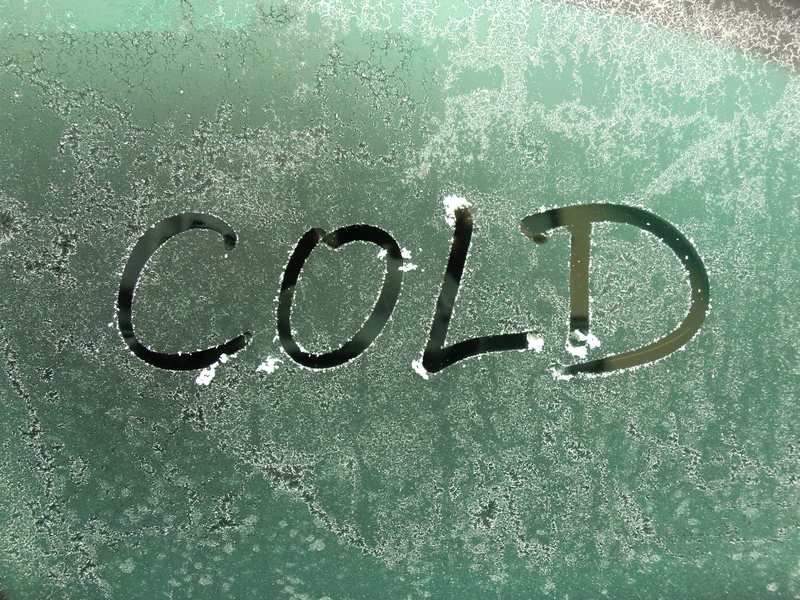 This predicament ultimately leads to wearing stretch pants over the course of the winter months. What better time to get started on the very popular resolution of losing weight and getting fit than right now? Join the movement to get moving! 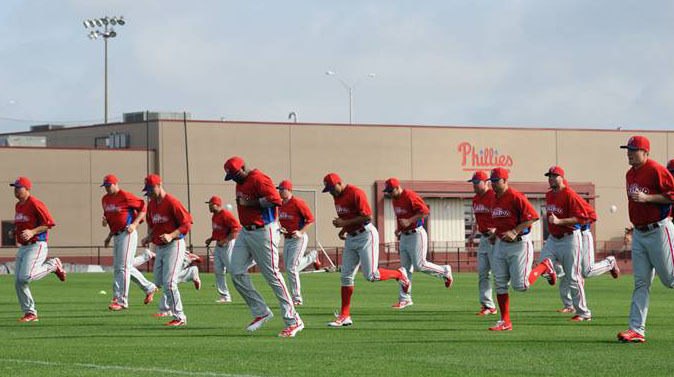 Check out Phillies Phitness, presented by NovaCare Rehabilitation, for tips to get you started and get into gear in 2014. Stretching, working out and eating healthy like a professional athlete sounds like a pretty awesome way to get fit, right? If you’re a physical education teacher, sign up for the program while you’re visiting the site and get your students involved too! If you need a little more motivation, sometimes it’s helpful to work toward a fitness goal like running in an organized race. 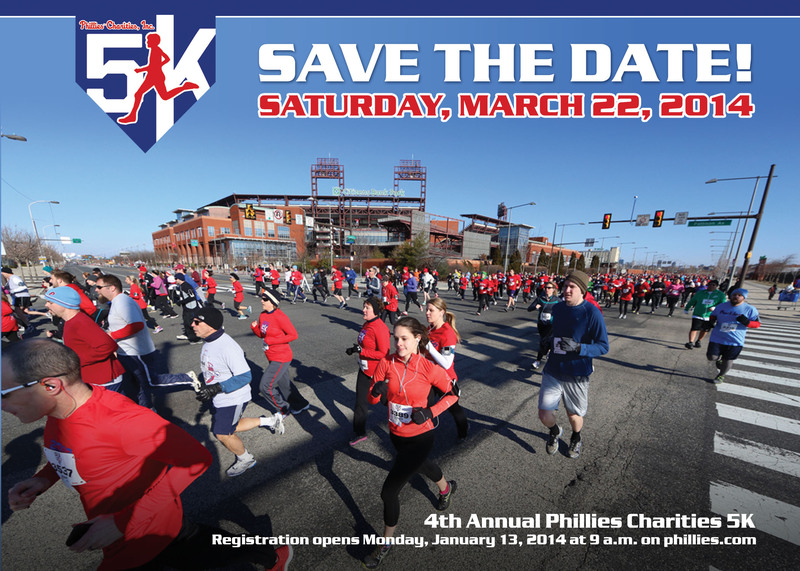 The Phillies thought of that too and are holding the 4th annual Phillies Charities 5K at Citizens Bank Park on Sunday, March 22nd! 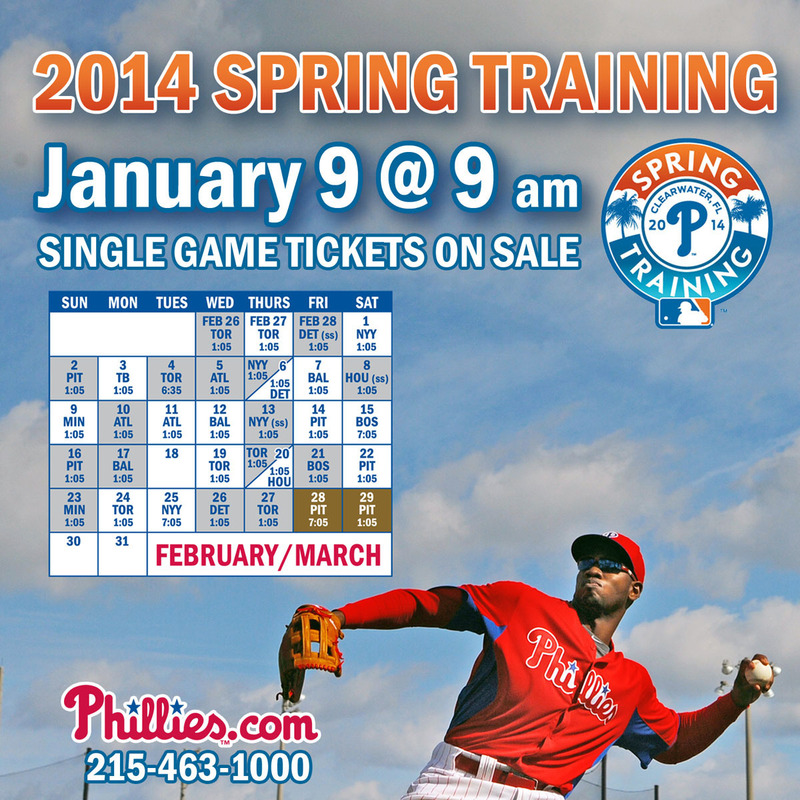 Registration opens on Monday, January 13th at 9:00 a.m. on phillies.com. The event has sold out in year’s past so make sure you sign up early to ensure your spot! Lace up those sneakers and get going! All the yoga and deep breathing in the world just isn’t cutting it and you need to resolve to reduce stress in your life? How does a nice getaway sound? We know, it sounds great. The big question: Where should your destination be? Well, come along with Phillies Vacations for Spring Training in Clearwater and then all over the US during the regular season! We love a good road trip. Close your eyes – after you finish reading this blog post, of course – and imagine yourself on Clearwater Beach, catching some rays while laying on the white sand before you head over to Bright House Field to see the Phillies play and then hit up the Tiki Bar postgame. Sounds good, we know. If you haven’t been to spring training, you need to go – it’s an all-around good time. But don’t take our word for it – go book your trip to get on your way to relaxation and sunshine. But you’re the travelling, adventure type, aren’t you? De-stressing to you means exploring a new city. We have you covered on this one too. Ever been on a Phillies’ road trip? No? Get ready to pack your bags and head to San Francisco with Greg “The Bull” Luzinski and Scott Palmer along with fellow Phillies fans to see the Fightins play at AT&T Park. Grab some garlic fries while you’re at the park too – so delicious. Remember to bring your camera for the excursion to Alcatraz where the ferry ride gives you bonus views of the Golden Gate Bridge. Really, the views all over San Francisco are truly breathtaking, especially from your seats watching a Phils win! The Phillies also head to the city that never sleeps, good old NYC, as well as the place where french fries are a salad topping aka Pittsburgh in 2014, bringing all the excitement the Big Apple has to offer and the Steel City in all its splendor. Side note: The Pirates home turf is known as having one of the most beautiful ballpark views in all of Major League Baseball – aside from CBP, obviously. 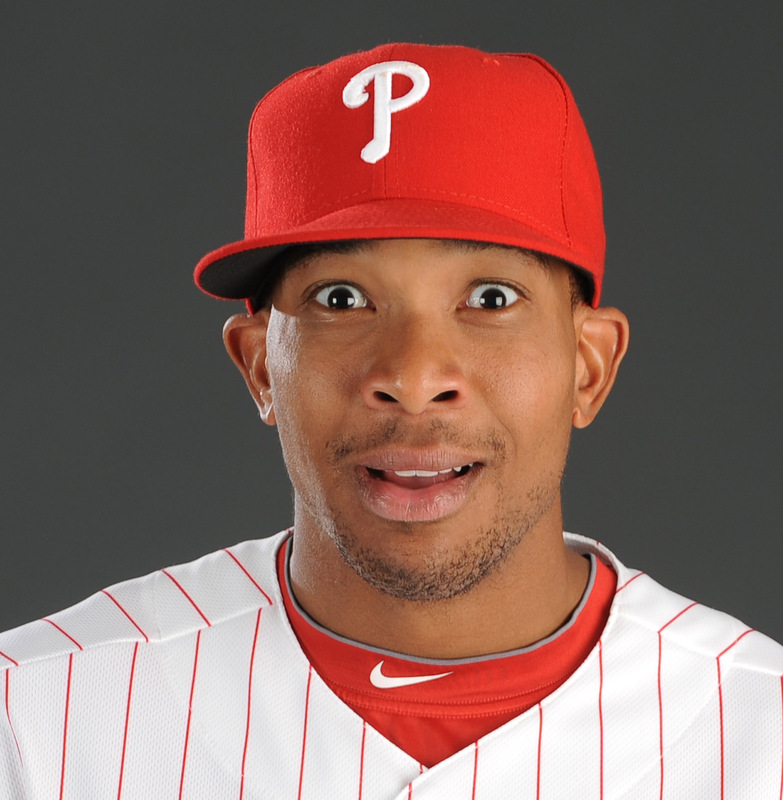 So head over to phillies.com to get all the info and book your trip today! Space is limited so resolve to quit procrastinating while you’re at it and do it immediately. Seriously, don’t miss out. We do hope you’ll give these resolutions a try. You’ll feel better doing it and being a brand new you this year, we promise!